President Muhammadu Buhari has approved the deployment of troops to six states across the restive north-central, the Nigerian Army announced Wednesday. David Ahmadu, head of training and operations at the Nigerian Army Headquarters in Abuja, said during a press briefing Wednesday afternoon that troops would be sent to the streets across the region in exercise ‘Ayem Akpatuma’ or ‘Cat Race’ when literally translated from Tiv, a major tribe in the north-central. While the Army did not disclose the size of the deployment, the operations will be carried in Benue, Taraba, Kaduna, Kogi, Nasarawa and Niger. The states have endured a rise in armed banditry, kidnapping and cattle rustling — in states like Kaduna and Niger — and herdsmen-farmers clashes and attacks on communities — as recently reported in Benue, Taraba and Nasarawa States — by armed militia. The deployment is also aimed at effectively checkmating the dreadful activities of the “militias” perpetrating criminal acts in these states and its environs, Mr. Ahmadu said at the briefing. The troops would be deployed from Nigerian Army 1 Division, Kaduna; 3 Division, Jos; Nigerian Army Record, Lokoja; and 707 Special Forces Brigade, Makurdi. The troops would be posted to units around their divisions and brigades and they will operate with the police and civil defence officers. Plateau is the only state in the north-central that was covered in the operation, despite reporting deadly clashes linked to the farmers-herdsmen crisis in recent weeks. Defence spokesperson John Agim did not respond to PREMIUM TIMES requests for comments about why Plateau State was not covered in the exercise Thursday night. The military says it aims to significantly degrade the capacity of criminals across the region, where hundreds have been killed in attacks this year alone. 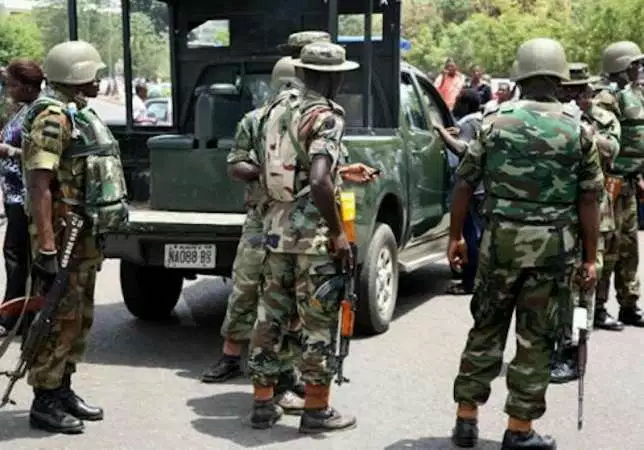 But during an earlier exchange, Mr. Agim, a brigadier-general, explained to PREMIUM TIMES that the operation would only last for six weeks because the aim of the military was to complement the efforts of the police, who have ramped up their activities since January 1 attacks in Benue. The Inspector-General of Police, Ibrahim Idris, has deployed nearly 1,000 police special forces to Benue, Nasarawa and Taraba within the last one month. The military says the troops that would participate in the exercise would conduct themselves in the most ethical and professional standards. Citizens who observe any misconduct of personnel are advised to call the military information centre at 193. The deployment is being planned even as the police maintain that they are capable of neutralising the attackers, most of whom are at large. “We’re equal to the task,” Habila Joshak, the deputy inspector-general of police in charge of operations, told PREMIUM TIMES by telephone Thursday. Mr. Joshak said the military is stepping in to “hasten the process of restoration of law and order” and “not necessarily” because the police “can’t cope”. Learnt from police sources that there was no request for backup from the police, a statement that was confirmed Mr. Agim. But officials in Benue State, which has suffered some of the most grievous assaults by suspected herdsmen this year, are expressing concerns about the scope of the operation and its timing. Mr. Agerzua told PREMIUM TIMES that there was little doubt about the position of Benue residents that the soldiers would find it difficult to secure needed authorisation to go after the attackers. “They’re not really ready to move to the flashpoints.,” Mr. Agerzua said by telephone Friday afternoon. He said the operation should have been more discrete and elaborate, saying the soldiers may end up cracking down on citizens than criminals. But a security analyst, Daniel Bwala, sees the planned deployment from its bright spots. He said the six-week timeframe was actually one of the key strategies the military deployed and should not be seen as though the the military chiefs are unsophisticated or reckless. “In a military operation, it’s always safer to give a short period,” Mr. Bwala told PREMIUM TIMES by telephone Friday afternoon. “But if there’s a need for them to deploy more, they would do that.”He said the timeframe could be a superficial ploy to confuse criminals and the military might have already been on the ground doing reconnaissance operations, especially in Niger and Kaduna States where kidnappers have been suffering casualties in recent weeks. “They might have deployed undercover operatives,” he said. Mr. Bwala, however, held that the police are incapable of stopping the attackers, especially with the weaponry the attackers deploy. Mr. Bwala suggested a timely amendment to the Constitution that will do away with the current federal structure of the police and give way for states to establish their individual police force.